NDSS quarterback Colby Webb airs out a pass during Wednesday's game at Regi. Photo by Adam Prudhomme. 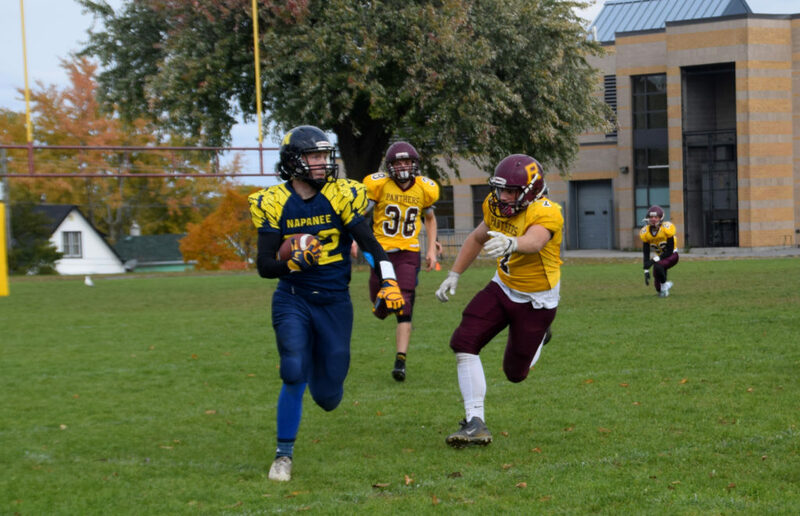 A disheartening ending to the KASSAA season befell the NDSS Golden Hawks senior football team, who were shutout 35-0 on the road by the Regiopolis-Notre Dame Panthers on Wednesday afternoon. 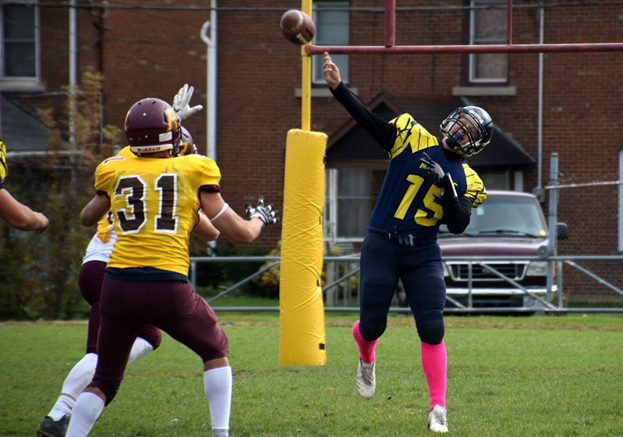 Napanee entered the game needing at least a tie for a shot at a postseason berth, but quickly fell behind and were never able to mount much of an offensive threat. Just as it was for much of the season, a lack of self discipline was the Hawks’ own worst enemy as they continued to give away free yards with a series of penalties. Regi scored on their opening drive, adding the extra point for a 7-0 lead just four minutes into the game. They doubled the lead on their second possession with a reverse hand-off and a burst of speed through a hole in the Hawks’ defense. NDSS’ Mason Parker leaps for the ball next to a Regi player. Photo by Adam Prudhomme. Hawks starting quarterback Colby Webb opted to use his arm more than in previous games and found a bit of success, relying on running back Cal DuChene the odd time to gain yards on the ground. The offense struggled to maintain pressure however and the game quickly got out of reach when the Panthers scored two more touchdowns in the second quarter, fuelled by a big interception midway through the quarter to stretch their lead to 28-0. NDSS showed a bit of promise in the second half with a pair of interceptions of their own, the second by Brayden Aldridge. Brock Vale goes on one of the longest runs of the day for NDSS. Photo by Adam Prudhomme. In the second half the Hawks turned to quarterback Ethan McKeown to take over at centre, but in the end it wasn’t enough to generate much offense. With the loss the Hawks ended their season at 1-5, a disappointing finish to a team that had plenty of talent but racked up too many costly penalties. Despite their record, the Hawks twice came within a mere yards of stealing a victory at both Bayridge and Ernestown, but ultimately came up short. Their 12-7 loss at Bayridge on Oct. 4 was particularly crushing, as a win in that game would have qualified them for the playoffs. As it stands they will miss out due to losing the head-to-head matchup against the Blazers, who also have just one win on the season. 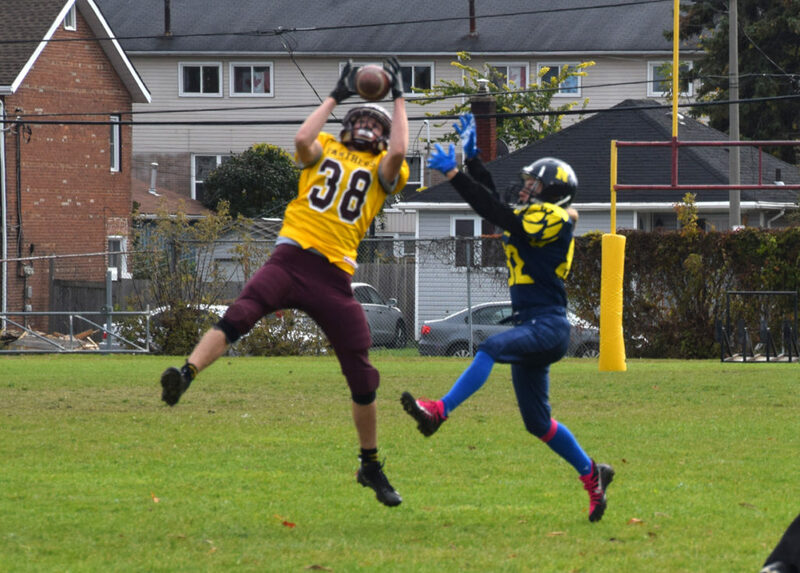 NDSS’ junior team was also shutout at Regi, losing 29-0 in the late game. With the loss their record falls to 0-5. They’ll have one last game on Wednesday, when they travel to Bayridge to play a make up of the Oct. 4 game that was postponed.